What Has Five Eyes, Six Legs and Two Pairs of Wings? What has five eyes, six legs, two pairs of wings and can fly about 20 miles per hour? Got to be an insect, right? More hints: It’s been around for 30 million years. Its primary form of communication is a chemical called a pheromone. Okay, now it gets easier. The queen lays about 2000 eggs per day during the peak season. The males are called drones. 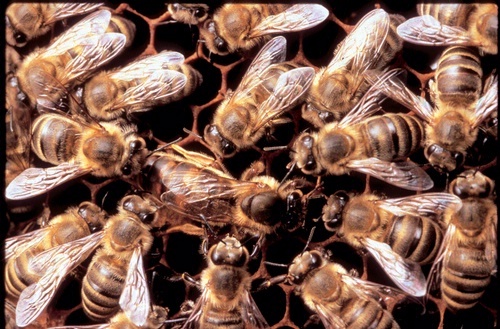 The workers carry pollen on their hand legs in a pollen basket or corbicula. Right. The mystery insect is the honey bee. UC Davis apiculturist Eric Mussen says bees must collect nectar from 2 million flowers to make one pound of honey. The average forager makes about 1/12th of a teaspoon of honey in her lifetime. Bees are important not just for their honey but for pollination. They pollinate about 100 agricultural crops in the United States. The average person in the United States eats about 1.3 pounds of honey per year. No wonder “honey” is a term of endearment.